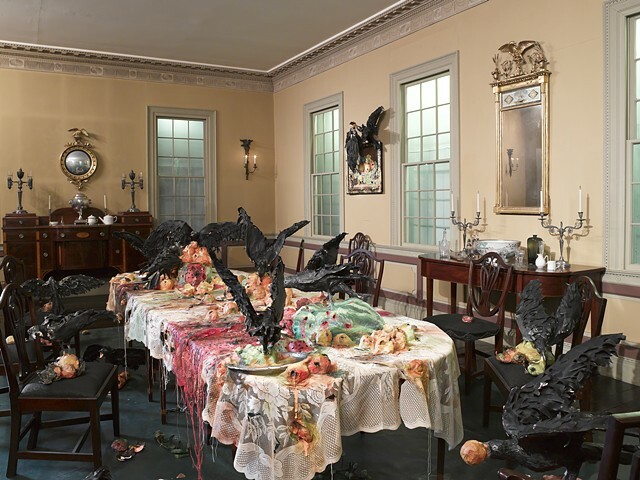 Valerie Hegarty: Alternative Histories is the second in a series inviting contemporary artists to activate the Brooklyn Museums Period Rooms. Hegartys site-specific artworks, which address themes of colonization, Manifest Destiny, and repressed history, are on display in the Cupola House parlor and hall, and in the dining room of the Cane Acres Plantation. Her installation in the Cupola House parlor includes a Native Americanpatterned rug that appears to be overgrown with grass, roots, and flowers, as well as two portraits in conversation, one of George Washington and the other of the Pawnee Chief Sharitarish. In her signature style, Hegarty has fabricated the portraits to look as though they are partially dissolved. In the Cupola House hall, she has replaced some of the furniture and dishes with her own, while adding her version of The Pic-Nic (1846) by Thomas Cole (18011848). All of these objects are riddled with holes. In the Cane Acres Plantation dining room, she has created a tableau that includes nineteenth-century still-life paintings come to life, with fruit bursting from their frames and into the room, to be picked at by three-dimensional crows. The installations cultural referents include Alfred Hitchcock, racial segregation, and vanitas paintings (still-life meditations on mortality).